Nostalgia-laden re-releases of old tech products seem to be a daily occurrence. Whether it’s Nintendo bringing back the NES Classic or Nokia resurrecting the 3310 and 8110 feature phones, every company under the sun is trying to get in on the nostalgia game. However, both Nintendo and Nokia continue to sell their new, modern products, and to great success. The Nintendo Switch is the fastest-selling console in the history of the company and Nokia sold 70 million phones between December 2016 and 2017. So why do these companies, and so many others, continue to resurrect their old products? Do they only want to make a quick buck off of our fond recollections? Do the bean-counters simply want to turn all of our happy memories playing Snake on the 3310 or Mega Man on the NES into profits? Or, are these brands trying to reconnect with their customers by taking us back to a simpler, better time? A time when your phone would last for weeks, not hours – or when you could crush your brother’s score on Super Mario Bros. 3 rather than having a 12-year-old call you a noob whilst dancing on your digital corpse in Fortnite. Of course, Nokia and Nintendo aren’t the only companies playing the retro game. The original Xbox controller was heavily criticized by reviewers and consumers alike when it arrived back in 2001, and was eventually replaced within the lifecycle of the console. Yet this, too, saw a re-release at E3 last year. Motorola continually hints at resurrecting its fondly-remembered RAZR line of phones and Sony’s President hinted in an interview that the company is considering making a new version of the original PlayStation. Fujifilm continues to develop its retro-style X100-series of compact cameras and Olympus matches them with it’s OM-D range. Record players and vinyl are, infamously, making a comeback, spearheaded by hipsters around the world. Meanwhile, Tamagotchi, Roller Coaster Tycoon and five Sega Genesis games have all returned in app form. 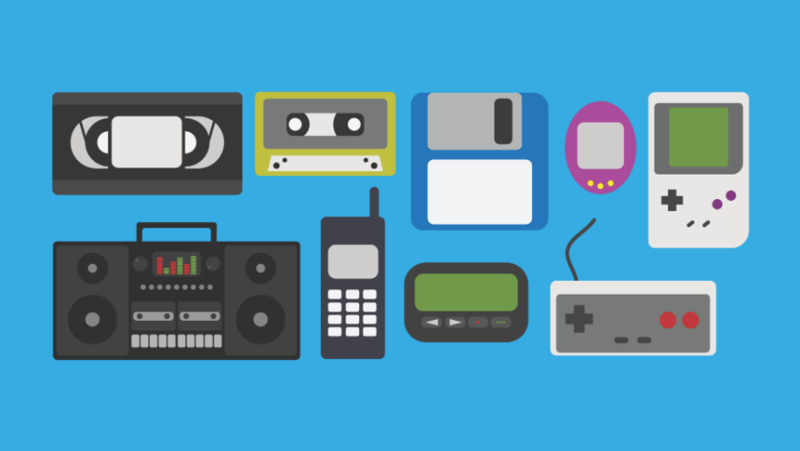 Why do we feel nostalgia for these products? This is the really interesting part. Since most of the products above originally launched, the world has undergone some remarkable changes. Phones have transformed from being, well, just phones, into pocket-sized computers keeping us up-to-date and contactable at all times. Games and consoles have become so advanced as to be almost beyond recognition – remember text-adventures? Records and vinyl have gone from being the standard, to obsolete, to kitsch, to cool. And cameras? Well, everyone has one on their phone, so it takes something special to make you want a separate camera. But, as Krystine Batcho pointed out, while people crave stability in life, “change is the default, not the exception”. When we were young, life was, generally, easier. You woke up, went to school, played games with your friends, came home, probably played some more and went to bed. Now though, as adults, life – and particularly tech life – can be stressful. Here’s a list of things that might, just in one day, cause you some stress: Work, commuting to work, your boss, no one replying to your WhatsApp, no one replying to your Tinder message, North Korea, Russia, Amazon tracking your face, Trump, terrorism, your phone dying, no one liking your Instagram post, outsourcing jobs, house prices. You get the idea. Not all of these worries are new, of course. But, to the people who were children when the NES, the SNES, the 3310, the PlayStation or the Tamagotchi were on sale, they are. The NES launched less than 35 years ago and was on sale until 1995. This generation (which includes myself – my first phone was a 3310) looks around and sees impermanence and instability. We can try to adapt, with portfolio careers in co-working spaces, or short-term rent arrangements in houses with people we don’t really know, but the future is largely out of our control. These products, on the other hand, offer fixed positive memories, emotions and feelings. Even if the Nokia 3310 bears almost no resemblance to its 90s predecessor, it’s comforting to know that it is exists and that it has a cultural significance for everyone, not just yourself. Is Nostalgia Good or Bad? Nostalgia can be seen as a regressive force, leading people backwards down blind alleyways into illusory cul-de-sacs to a time that was less advanced, less reasonable and less rational. This is known as historical nostalgia. But, personal nostalgia is a little different. This tends to focus around relationships, with people or with objects. This is the type of nostalgia that can fortify us in the face of uncertainty – the type we experience when we think of Mario Kart, 8110s and Moto RAZRs. Such nostalgia links us back to a better past – a past with highscores, not credit scores. As long as we’re clear that the nostalgia we feel for things, people and places in our personal past is just that – personal – then there’s little real downside. If connecting with our past can help us feel connected to the world we currently live in, then it has to be a good thing. Right? But, if all we want to buy is old stuff, what’s the point of any company releasing anything new and innovative? In the same way that nostalgia can make us feel good, novelty and newness stops us becoming bored. Imagine if the only game you ever played was The Legend of Zelda. It’s still great, but you’d likely be finished with it after the second or third play-through. It’s also the initial novelty that forms experiences that will some day be nostalgic. After all, there’s no way we’d be able to form positive memories of something if it’s the same as we always knew. Going back isn’t always better. The incredible power of modern devices, from games console to mobile phones, can leave older tech looking a little flat and unpolished. With all that being said, though, if those PlayStation revival rumors ring true, I’ll be the first in the queue.